1. Engineer (Chemical) - First class Degree in Engineering / Technology in Chemical / Petroleum / Petrochemicals with not less than 60% mark in aggregate of all Semesters / Years. SC/ST candidates need to score a minimum 55%. + Minimum two years of relevant post qualification work experience in Process Units preferably in a Crude Oil Refining / Chemical / Petro-Chemicals / Fertilizer industries, etc. Exposure to commissioning, start-up, dayto-day operations, shutdown & trouble shooting and knowledge of DCS, PFDs, P&IDs, Logic Descriptions, Instrument Data Sheets, Cause and Effect Diagram, HAZOP and Safety norms pertaining to Process Units in a Refining / Chemical / Petro-Chemicals / Fertilizer Hydrocarbon processing Industry will be an added advantage. 3. Engineer (Electrical) - First class Degree in Engineering / Technology in Electrical / Electrical & Electronics with not less than 60% mark in aggregate of all Semesters / Years. + Minimum two years of post-qualification work experience in any process industry preferably in Petroleum / Petrochemical / Chemical / Fertilizers / Power Industry in maintenance of Electrical Equipment like LT/HT motors, LT/HT transformers, LT/HT breakers, PCCs, MCCs, Battery charge system etc. 4. Engineer (Civil) - First class Degree in Engineering / Technology in Civil with not less than 60% mark in aggregate of all Semesters / Years. + Minimum two years of relevant post qualification work experience in any Process Units preferably in a crude oil Refining / Chemical / Petro-Chemicals / Fertilizer / Hydrocarbon processing Industry. 5. Engineer (Metallurgy) - First class Degree in Engineering / Technology in Metallurgy with not less than 60% mark in aggregate of all Semesters / Years. + Minimum two years of relevant post qualification work experience in any Process Units. 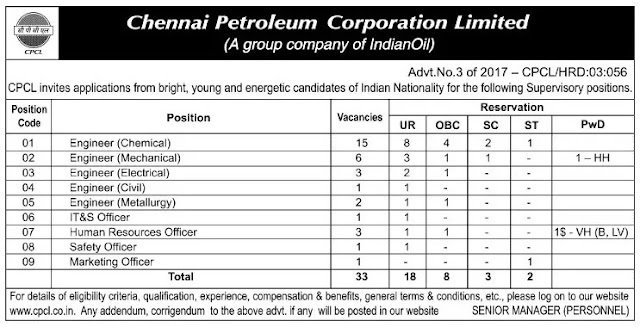 Preference will be given to candidates having experience in a crude oil Refining / Chemical / Petro-Chemicals / Fertilizer / Hydro-carbon processing Industry. 6. IT&S Officer - First Class Degree in Engineering in Computer Science / Information Technology / Electronics & Communication with not less than 60 % Marks in aggregate of all Semesters / Years. + Minimum two years of relevant post qualification experience. Candidates having experience in designing, implementing, and troubleshooting network administration. Experience in designing, implementing, and troubleshooting IT security. Knowledge of latest switches, routers and firewalls. Familiarity with the latest software and hardware knowledge in network and security technologies. Knowledge of multiple operating systems and server administration. Excellent analytical and problem solving skills. Ability to detect and prevent Cyber security issues will be given preference. 7. Human Resources Officer - Graduate in any discipline with two years full-time regular course leading to PostGraduate Diploma / Masters Degree inHuman Resource Management / Personnel Management / Industrial Relations / Labour Welfare / Master ofSocial Work / Masters Degree inBusiness Administration (MBA) or equivalent with specialization inPersonnel Management & LabourWelfare / Human Resources with not less than 60% mark in aggregate of allSemesters / Years. + Minimum two years of relevant post qualification experience. Candidates having experience in HR policy formulation / Labour Laws & IR / Manpower Planning & Recruitment / Training & Development / Employee Relations / establishment matters / Employees Performance Appraisal System / Corporate Social Responsibility etc. will be given preference. 8. Safety Officer - First class degree in any branch of Engineering or Technology with not less than 60% mark in aggregate of all Semesters / Years. Should possess a degree or diploma in Industrial safety recognized by Govt. of India/ approved by Govt. Regulatory Bodies. Should possess adequate knowledge of Tamil language. + Minimum two years of relevant post qualification experience. Candidates having experience in a factory in the level of Supervisory capacity as Safety Officer will be given preference. 9. Marketing Officer - Engineering Graduate in either Chemical or Mechanical discipline with minimum 55% marks in aggregate of all Semesters / Years with a) Two years full-time regular course leading to Post Graduate Diploma in Marketing Management, with not less than 55% mark in aggregate of all Semesters / Years or, b) Two years full-time regular course leading to Masters Degree in Business Administration (MBA) with specialization in Marketing Management with not less than 55% mark in aggregate of all Semesters / Years, or c) Any equivalent full-time regular course with specialization in Marketing Management with not less than 55% mark in aggregate of all Semesters / Years + Minimum two years of relevant post qualification experience in sales & marketing. Preference will be given to candidates with marketing exposure in petroleum / petrochemical / fertilizers / coal industry of large volume products including customer identification, product launching, market segmentation, product positioning, market scanning, formulation of marketing strategies for maintaining / improving sales volume, after sales support / feedback, etc. For the Position Codes 01 to 06, the selection shall be made through Written Test (to be held in Chennai only) and Personal Interview of the short listed candidates for assessment of different facets of Knowledge, Skills, Attitude, Aptitude, etc. For the Position Codes 07 to 09, the selection shall be made through Personal Interview of the eligible candidates only. Candidate belonging to General / OBC categories are required to pay online a non-refundable registration fee of Rs.500/- (Rupees Five hundred only). No other means / mode of application shall be accepted. CPCL will not be responsible for non-receipt / bouncing back of any email sent to the candidate. The SC / ST / PWD / Ex- servicemen candidates are exempted from payment of application fee.